The feeling blue is just an introduction to this write- up about blue moons. There is really no connotation about blue or sad feelings. Blue moons however are fairly rare and as such there is the term “blue moon”, which when used in speaking is used colloquially to mean a rare event, as in the phrase “once in a blue moon“. You may think the idea of a blue moon has something to do with the color of the moon. But in actuality the term has nothing to do with the color of the moon. A literal “blue moon” (the moon appearing with a tinge of blue) is possible to actually occur in certain atmospheric conditions, e.g. volcanic eruptions and exceptionally large fires can leave particles in the atmosphere. Such actual occurrences of these unusual conditions making the moon appear blue are also rare and specific conditions having nothing to do with the normal use of the term “blue moon” (see When the Moon actually looks blue below). A blue moon is usually used to describe a second full moon in a single solar calendar month, which happens every two to three years (seven times in the Metonic cycle of 19 years). The usage of the term blue moon to describe the second full moon in one calendar month results from a misinterpretation of the traditional definition of that term in the March 1946 issue of Sky & Telescope. Beforehand, the term was used to describe the third full moon in a season with four. Some have suggested has that the term “blue moon” means “intercalary month” and arose by folk etymology, the “blue” replacing the no-longer-understood belewe “to betray”. The original meaning would then have been “betrayer moon”, referring to a full moon which would “normally” (in non-intercalating years) be the full moon of spring, while in intercalating year, it was “traitorous” in the sense that people would have had to continue fasting for another month in accordance with the season of Lent. Blue moon of August 31, 2012, viewed from Slobozia, Romania. The earliest recorded English usage of the term blue moon is found in an anti-clerical pamphlet (attacking the Roman clergy, and cardinal Thomas Wolsey in particular) by two converted Greenwich friars, William Roy and Jerome Barlow, published in 1528 under the title Rede me and be nott wrothe, for I say no thynge but trothe. The March 1946 Sky and Telescope article “Once in a Blue Moon” by James Hugh Pruett misinterpreted the 1937 Maine Farmers’ Almanac. “Seven times in 19 years there were – and still are – 13 full moons in a year. This gives 11 months with one full moon each and one with two. This second in a month, so I interpret it, was called blue boon.” Widespread adoption of the definition of a “blue moon” as the second full moon in a month followed its use on the popular radio program StarDate on January 31, 1980. The most literal meaning of blue moon is when the moon, although it doesn’t have to be a full moon, appears to a casual observer to be unusually bluish, which is a rare event. The effect can be caused by smoke or dust particles in the atmosphere, as has happened after forest fires in Sweden and Canada in 1950 and 1951. Also the moon appeared visibly blue after the eruption of Krakatoa in 1883, which caused the moon to appear blue for nearly two years. Other less potent volcanoes have also turned the moon blue. People saw blue moons in 1983 after the eruption of the El Chichón volcano in Mexico, and there are reports of blue moons caused by Mount St. Helen’s in 1980 and Mount Pinatubo in 1991. In the novels of Simon R. Green blue moon plays a significant magical role, and also figures in titles of two his novels: Blue Moon Rising and Beyond the Blue Moon. In the 2011 movie The Smurfs. The blue moon was literally a bright blue-colored moon, a period of time in the Smurfs’ medieval world where it becomes possible to cross dimensions via an underground waterfall, which helps set the premise of the film’s plot by sending several Smurfs to our world. The Blue Moon Detective Agency, from the television series Moonlighting. In the 2009 young adult fiction novel by Alyson Noël of the same name, Blue Moon refers to two full moons occurring within the same month and the same astrological sign. The blue moon was referenced in Charmed, where the Charmed Ones were magically transformed into monsters. The Connie Willis short story, “Blued Moon” deals with the consequences of an artificial blue moon. “Blue Moon” is a popular music standard, written by Richard Rodgers and Lorenz Hart in 1934. “New Blue Moon”, released in 1990, was a song written and recorded by the Traveling Wilburys. “Once in a Very Blue Moon” was written by the Nashville songwriter Patrick Alger with Eugene Levine. It was recorded by folk/country artist Nanci Griffith in 1984, as well as by Dolly Parton and Mary Black. As a child, 1960s/70s Major League Baseball pitcher John Odom was nicknamed “Blue Moon” by a classmate who thought his round face resembled the moon. In Gilligan’s Island season 2 episode 23, Ginger: The rescue boat will arrive- Gilligan: When? When? Ginger: “Not soon enough for friends so true, Look for the boat when the moon is blue.” In truth, the boat did appear but Gilligan did not build the signal fire for rescue because he found out the premonition was not real. Want to get complicated about a Blue Moon? There are a few other definitions of a blue moon, but you’ve read above the most popular of them. But we are in an age of lots of technical terms so wouldn’t you know it – Google, you do know of Google, don’t you? Google created a rather complicated definition of blue moon. If you are versed in electronics, astronomy, or some other scientific and technical disciplines then you might easily grasp Google’s definition of a blue moon. According to Google Calculator, “once in a blue moon” is equal to 1.16699016 × 10-8 hertz. The hertz is a unit of frequency (one cycle per second), and thus if the mean length of time between blue moons (2.1745 years according to Google) is converted to the metric system and converted to a frequency (by calculating the multiplicative inverse), it can be expressed in terms of hertz. 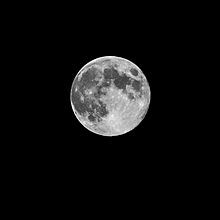 Although not elaborated here, nor in the definition of a blue moon, it is a full moon. Being such, there are superstitions and supposed behaviors of some people when there is a full moon. Read here something about full moon superstitions. And if you happen to see the moon tonight it is one of those “once in a blue moon” nights.